Lol – ok, I know I have not been around these parts much. Partly because life has drawn me elsewhere, partly because I was having a bit of a sewing lull and needed some time away, and partly because the things I am sewing are handmade gifts for people I love that actually read this blog or follow me on Insta! Spoiler Christmas presents are nowhere near as much fun :). So while I may not be around the blog as often as I would like, that doesn’t mean I am not around my sewing machine. And I think that is alright. After all, part of the growth of sewing and blogging is getting to the point of not having to share every little thing you make – no matter how awesome it might be. Some things are simply meant to be cherished, for the pure love of sewing. Made for an audience of One. All of that being said, I am here TODAY. And I am super excited about that. You see, today’s tutorial might not be all that groundbreaking and technical. But I think that is what I actually love about it. 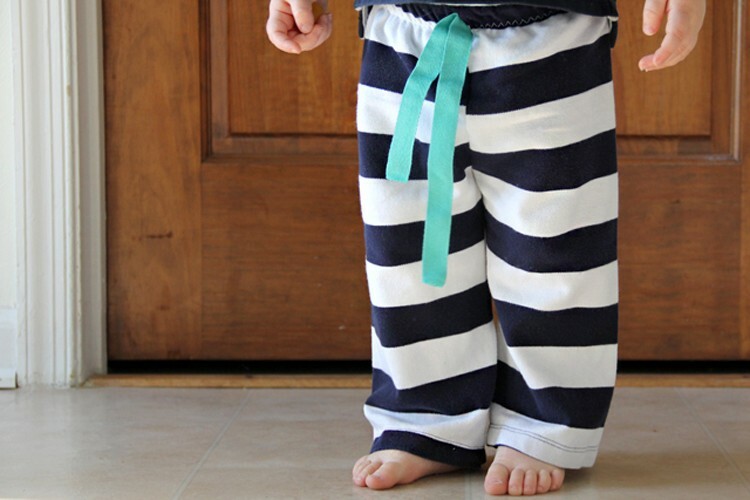 When I started this blog, it was all about learning how to sew. 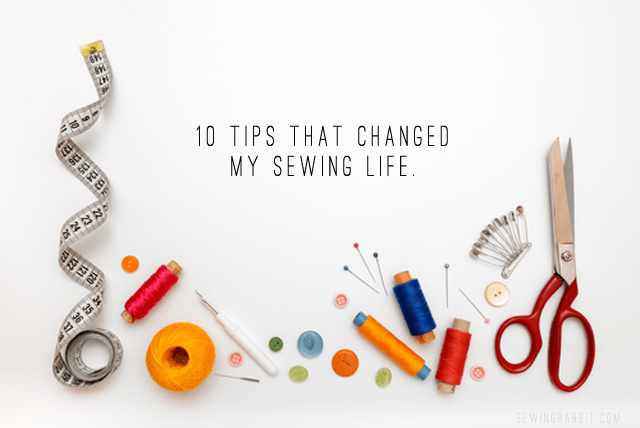 It was about learning basic techniques, and teaching others that sewing didn’t have to be difficult, but rather it is a life-skill anyone can pick up and learn. 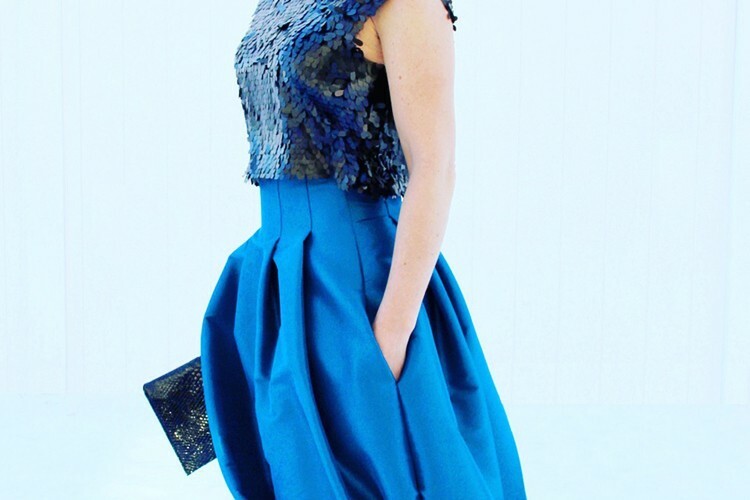 Sewing can be, and is, FUN!!! And while there is a time and place for intermediate level or difficult patterns, there is also a time and place for the beginning projects. The ones that just make you happy. Today’s post is bringing it back to the basics. Purely for the fun of sewing. Every Autumn my girls ask me for a brand new fleece jacket. It has become a tradition in where I bring all of the kids to the fabric store and let them pick out their own fabric. This past trip my son wanted to pick out his own fleece fabric, but he didn’t want a jacket. Nope. Not my boy. He wanted to make swords with POCKETS. So that is exactly what we did. 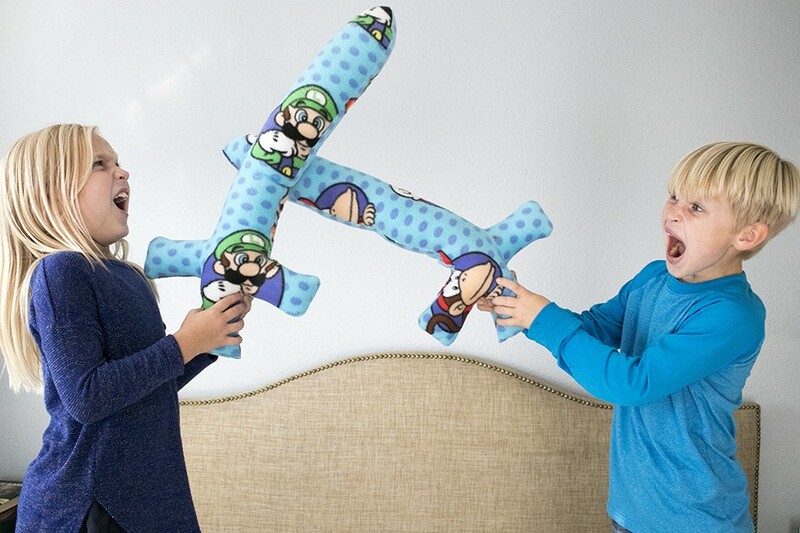 He picked out his favorite Super Mario fabric and we made dueling pillow swords with it…with pockets. Enter super duper fun here. 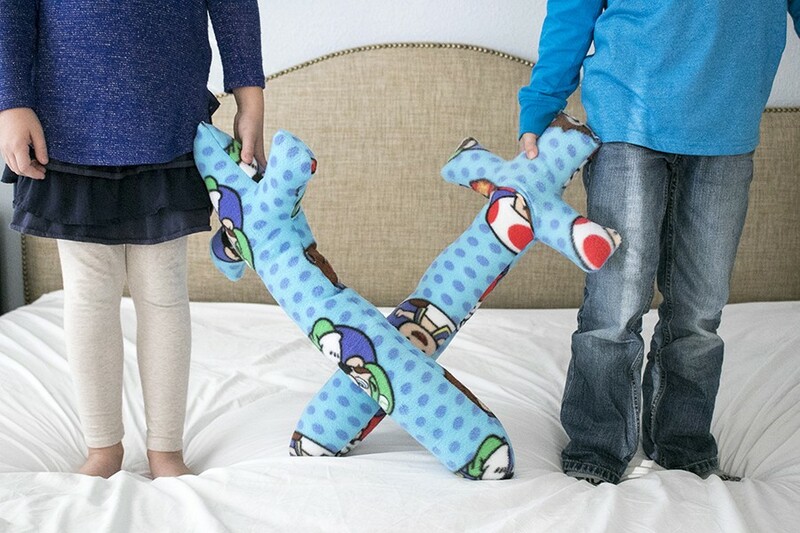 Oh my goodness, we have been having the absolute time of our lives with these silly little sword pillows! 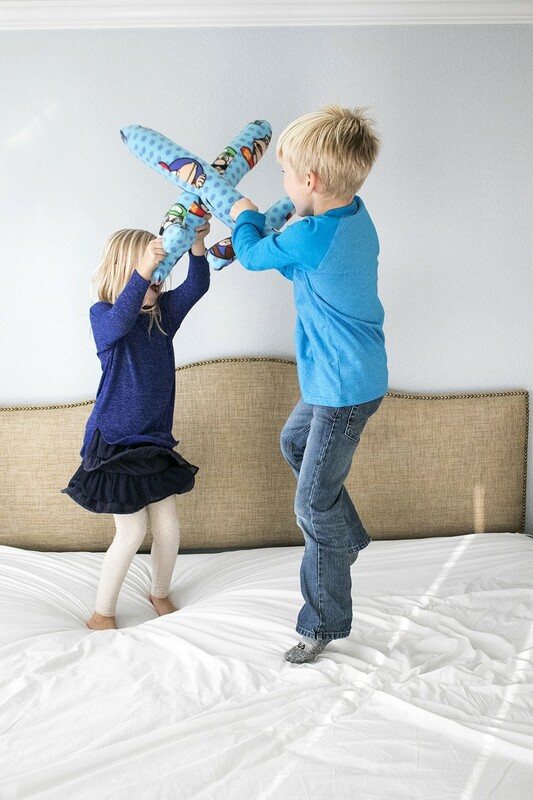 We have one of those houses where neighborhood kids are constantly in and out, and ever since these pillows have been made I have been listening to the squeals of delight from sword pillow fight battles. It has been an all out war, in the absolute best way possible. And the very best part is, I know beyond the shadow of a doubt that nobody is going to get hurt with these sword pillows! I mean, these things are a total Mom WIN. And they only took me around 10 minutes to sew, per sword. COME ON. You cannot get better than that. For real. 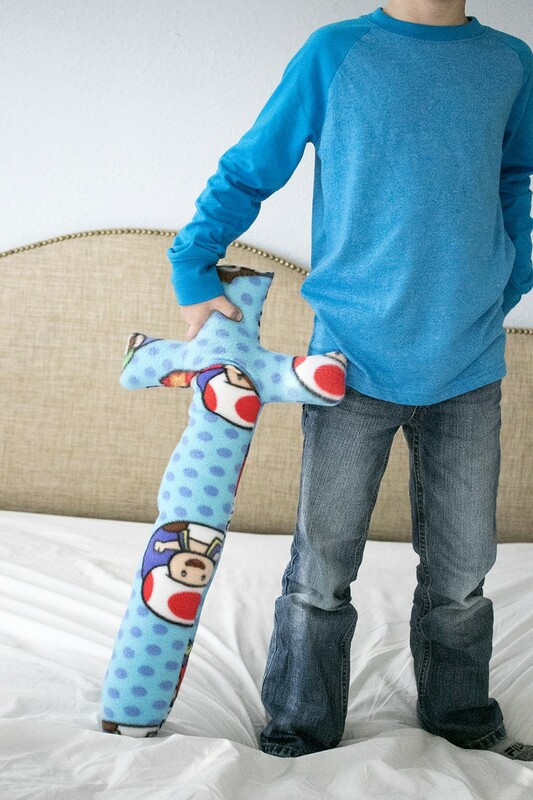 These fleece sword pillows will win the hearts of any boy or girl 10 years old and under :). That being said, it was in the middle of an epic sword battle when I realized I needed to share these fun little handmade toys with the world. 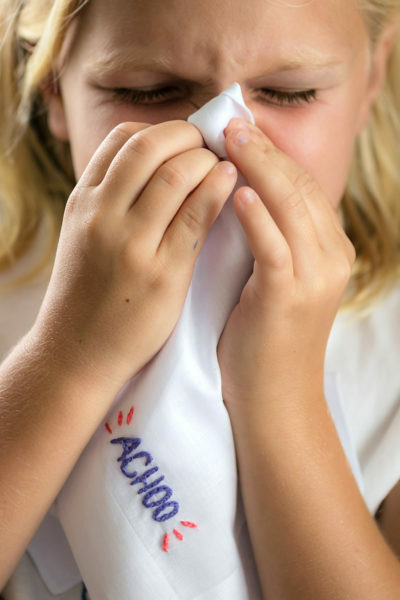 Every child deserves to have this much fun, especially when the DIY is so easy to make! 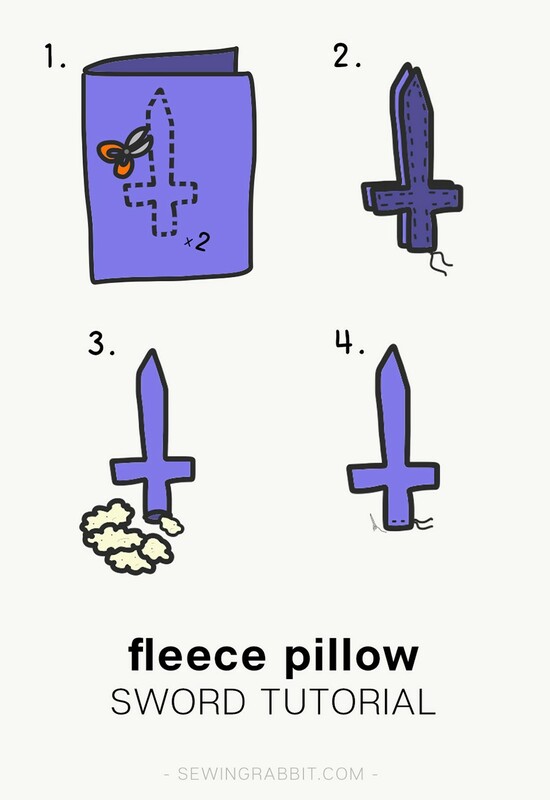 Fold the fleece fabric in half, and cut out the basic shape of a sword. This will give you two identical shaped images, a sword front and back. 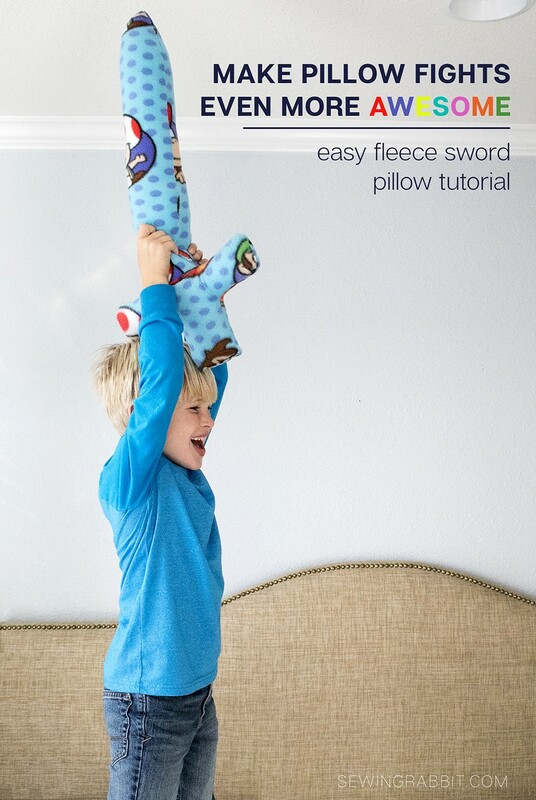 *Note – If you are using the full yard of fleece – by folding the fabric in 4ths you can make a pair of swords for dueling. Place sword front and back right sides together, matching up all edges. Pin around, leaving the bottom of the sword hilt open. Sew using a regular straight stitch. Clip corner seams. Turn sword right side out. Push out all corners. Stuff with PolyFil until it is extra firm. Pin opening closed and sew to secure. How wide and how long did you make the swords? I only used one yard of fabric, which made 2 swords easily. The swords are about 36″ long, and 13-14″ wide at the hilt. Hope this helps! Loved it.Would definetly sew it.My kids will love it for sure.The size of the sword is also very perfect.Only thing i may be opt for doremon design. As Winnie the Pooh would say “TTFN”. I really love it. 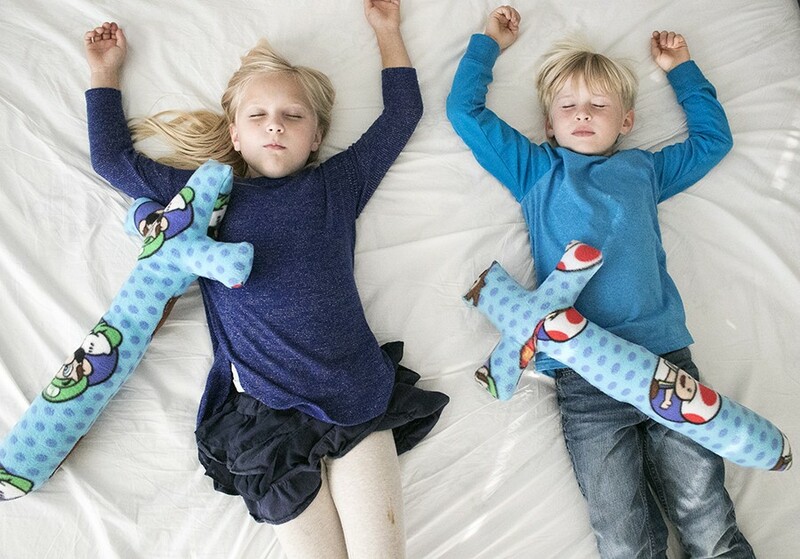 You will be glad to know that, I have 2 kids they will love it for sure.